With so much focus now on the customer’s experience, facility managers can be easily overwhelmed with maintaining the simplest of security policies and procedures – like managing who has keys. 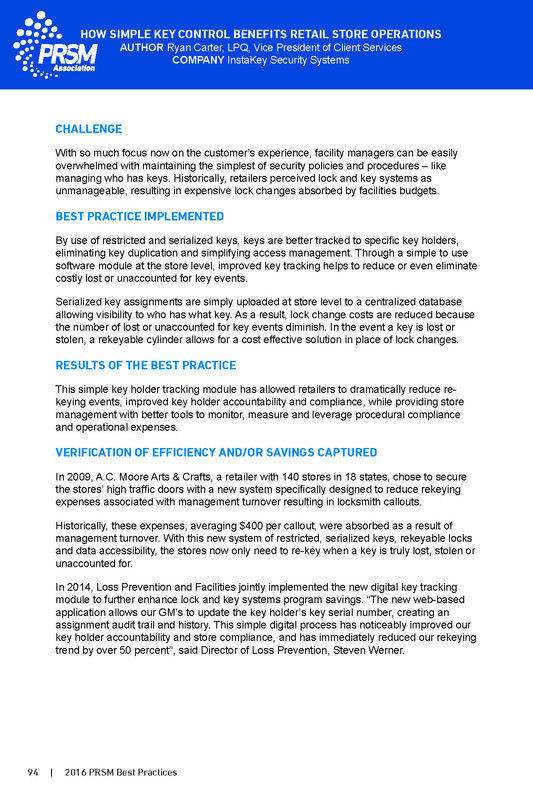 Historically, retailers perceived lock and key systems as unmanageable, resulting in expensive lock changes absorbed by facilities budgets. This simple key holder tracking module has allowed retailers to dramatically reduce rekeying events, improved key holder accountability and compliance, while providing store management with better tools to monitor, measure and leverage procedural compliance and operational expenses. Historically, these expenses, averaging $400 per callout, were absorbed as a result of management turnover. With this new system of restricted, serialized keys, rekeyable locks and data accessibility, the stores now only need to re-key when a key is truly lost, stolen or unaccounted for.